A simple blood test may one day replace invasive biopsies thanks to a new device that uses sound waves to separate blood-borne cancer cells from white blood cells. Carnegie Mellon University President Subra Suresh and fellow researchers from the Massachusetts Institute of Technology and The Pennsylvania State University report the latest advancement that brings their device one step closer to clinical use in a paper published this week in the online early edition of the Proceedings of the National Academy of Sciences (PNAS). Schematic illustration of the high-throughput device for separating cancer cells from white blood cells. Earlier attempts to develop such a device, while promising, proved to be far too slow for clinical use. 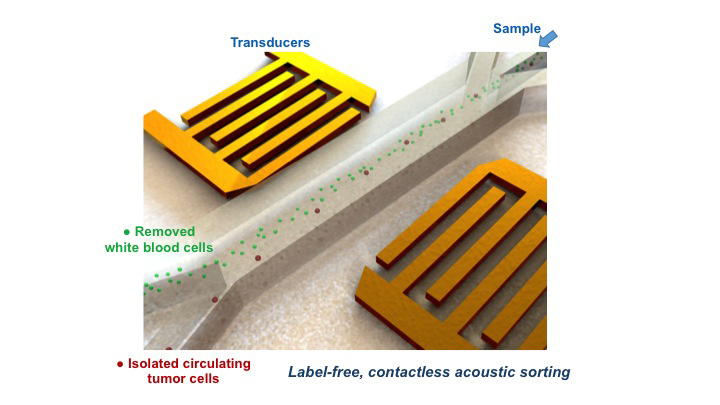 But in the new paper, the researchers report the development and validation of a microfluidic chip that uses sound waves to separate circulating tumor cells (CTC) from white blood cells, to be up to 20 times faster than prior attempts. This enables the use of the device for basic research and makes the idea that clinicians could remove intact circulating tumor cells (CTCs) from a standard blood draw closer to becoming a reality. Additionally, the researchers tested their device, for which a patent application has been filed, using patient samples for the first time. These tests proved that their method for separating CTCs from cancer cells is as effective as the current FDA-approved technique. When a physician wants to determine whether or not a tumor is cancerous, or learn more about a patient’s cancer — for instance, whether or not a tumor has metastasized, or if a tumor is genetically predisposed to respond to a certain therapy — a sampling of cells is removed from the tumor through a biopsy. Depending on the location of the tumor, a biopsy can be painful and invasive. CTCs offer the promise of a much less invasive option, often referred to as a “liquid biopsy.” CTCs are cells that have been shed from a primary tumor and circulate through the body via the blood stream. They are of great interest to cancer researchers and clinicians because they offer a way to gather cancer cells through a routine blood draw rather than a biopsy. CTCs can provide more information about metastasis, response to treatment and the genetic nature of a patient’s cancer than cells taken directly from a tumor. In many cases, CTCs are too rare to be detectable because there might be only one CTC among hundreds of thousands of white blood cells. Currently, most researchers find and isolate the traveling tumor cells either by using fluorescence and magnetic techniques or by mechanical means. Some of these methods require the cancer cells to be tagged using antibodies, which can alter the cell’s genetic and physical make-up. Other research groups have developed ways to remove CTCs using strong mechanical forces, which also can damage the cells. While all of these techniques allow researchers to count the number of CTCs in a blood sample for possible cancer diagnosis, researchers often can’t use the altered cells to reliably perform any additional functional tests. The new device could help to solve this problem. It doesn’t require the use of any damaging tags. It uses only a gentle mechanical force created by sound waves, allowing scientists to recover whole, unaltered CTCs that are ready for further testing. The authors also have demonstrated that, at the cell level, the device preserves the integrity of the separated CTCs, somewhat similar to the gentle way in which ultrasound has long been used in medical imaging and diagnostics. To test a blood sample using the device, the researchers remove the red blood cells from the sample, and introduce the remaining blood product into a channel in the dime-sized chip. As the sample travels along the channel, it passes through sound waves that have been angled across the channel. By angling the sound waves, the researchers have created a gauntlet of pressure nodes that push the cells away from the center of the channel. Since cancer cells have different size and compressibility than normal white blood cells, they are propelled at different trajectories by the sound waves. The researchers were able to establish what path each cell type would take, and created two channels along those paths to collect the separated cells. In previous versions of the device, the throughput rate was too slow for clinical use — it would have taken between 30 and 60 hours to separate the cells in one vial of blood (approximately 5 milliliters). The researchers used computer modeling and parametric numerical simulations to find ways to alter the device to make it more efficient. From models, they were able to come up with an optimized design for the geometry of the channels on the chip, and tilt angles of and width of the acoustic transducers. They took the information generated by the simulations and created new sample prototypes. The most efficient prototype processed a sample 20 times faster than their original prototype, taking only approximately five hours to process a 5-milliliter sample. The researchers used this faster version of the chip to test blood samples from three women with diagnosed breast cancer. In terms of counting CTCs, their results were found to be consistent with previous tests performed using the traditional FDA-approved CellSearch ® cell-tagging method. Furthermore, in one of the samples, they found only one CTC. On further consultation with that patient’s doctor, they found that the patient was responding well to treatment, further demonstrating the device’s promise for detecting cancer and metastasis, and monitoring the effectiveness of treatment. The increased speed of the device makes it ready to use for laboratory research, but researchers warn that it’s still too slow for broad clinical use. They plan to continue to refine the device to make it more suitable for separating CTCs from a vial of blood in less than 30 minutes, which will make it more amenable to commercialization. They also hope to develop a version of the device that can be used with whole blood samples, eliminating the need to remove the red blood cells. President Suresh is in a rare group of academic leaders who have maintained a strong scholarly presence in research. His individual academic achievements have been globally recognized and have continued, in addition to his leadership accomplishments throughout his major responsibilities as dean of the school of engineering at MIT, as director of the National Science Foundation, and now as president of Carnegie Mellon. Since accepting the presidency of CMU, Suresh has published about a dozen articles in leading scientific journals and has filed several CMU patents. Suresh said that while the duties of the presidency at CMU are his top priorities and focus, he intends to continue, to the extent possible, connections to research and to the mentoring and training of young scholars. Co-authors of the study, whose research was supported by the National Institutes of Health (1 R01 GM112048-01A1, 1 R33 EB019785-01), the Penn State Center for Nano Scale Science and the National Science Foundation, include: Peng Li, Zhanming Mao, Yuchao Chen, Po-Hsun Huang and Tony Jun Huang of The Pennsylvania State University; Zhangli Peng (now at the University of Notre Dame) and Ming Dao of the Massachusetts Institute of Technology; and Lanlan Zhou, Cristina I. Truica, Joseph H. Drabick, Wafik S. El-Deiry of the Penn State Hershey Cancer Institute. Watch the video "Detecting rare cancer cells with sound waves."